Upon the release of their first album in the late ’70s, Tom Petty & the Heartbreakers were shoehorned into the punk/new wave movement by some observers who picked up on the tough, vibrant energy of the group’s blend of Byrds riffs and Stonesy swagger. In a way, the categorization made sense. Compared to the heavy metal and art rock that dominated mid-’70s guitar rock, the Heartbreakers’ bracing return to roots was nearly as unexpected as the crashing chords of The Clash. As time progressed, it became clear that the band didn’t break from tradition like their punk contemporaries. Instead, they celebrated it, culling the best parts of the British Invasion, American garage rock, and Dylanesque singer/songwriters to create a distinctively American hybrid that recalled the past without being indebted to it. The Heartbreakers were a tight, muscular, and versatile backing band that provided the proper support for Petty’s songs, which cataloged a series of middle-class losers and dreamers. While his slurred, nasal voice may have recalled Dylan and Roger McGuinn, Petty’s songwriting was lean and direct, recalling the simple, unadorned style of Neil Young. Throughout his career, Petty & the Heartbreakers never departed from their signature rootsy sound, but they were able to expand it, bringing in psychedelic, Southern rock, and new wave influences; they were also one of the few of the traditionalist rock & rollers who embraced music videos, filming some of the most inventive and popular videos in MTV history. His willingness to experiment with the boundaries of classic rock & roll helped Petty sustain his popularity well into the ’90s. Born and raised in northern Florida, Tom Petty began playing music while he was still in high school. At the age of 17, he dropped out of school to join Mudcrutch, which also featured guitarist Mike Campbell and keyboardist Benmont Tench. By 1970, Mudcrutch had moved to Los Angeles with hopes of finding a record contract. The fledgling Shelter Records, founded by Leon Russell and Denny Cordell, offered the group a contract. However, Mudcrutch splintered apart shortly after relocating to L.A. Cordell was willing to record Petty as a solo act, but the singer’s reception to the idea was tentative. Over the next few years, Petty drifted through bands, eventually hooking back up with Campbell and Tench in 1975. At the time, the duo were working with bassist Ron Blair and drummer Stan Lynch; soon, Petty became involved with the band, which was then named the Heartbreakers. 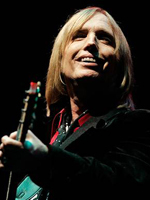 Petty was still under contract to Shelter, and the group assumed his deal, releasing Tom Petty & the Heartbreakers in 1976. Initially, the band’s debut was ignored in the United States, but when the group supported it in England with a tour opening for Nils Lofgren, the record began to take off. Within a few months, the band was headlining its own British tours and the album was in the U.K. Top 30. Prompted by the record’s British success, Shelter pushed the album and the single “Breakdown” in the U.S., this time to success; “Breakdown” became a Top 40 hit and “American Girl” became an album-oriented radio staple. You’re Gonna Get It, the Heartbreakers’ second album, was released in 1978 and it became the group’s first American Top 40 record. Petty & the Heartbreakers were poised to break into the big time when they ran into severe record company problems. Shelter’s parent company, ABC Records, was bought by MCA Records, and Petty attempted to renegotiate his contract with the label. MCA was unwilling to meet most of his demands, and halfway through 1979, he filed for bankruptcy. Soon afterward, he settled into an agreement with MCA, signing with their subsidiary Backstreet Records. Released late in 1979, Damn the Torpedoes was his first release on Backstreet. 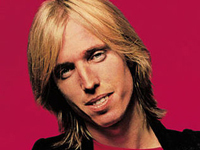 Damn the Torpedoes was Petty’s breakthrough release, earning uniformly excellent reviews, generating the Top Ten hit “Don’t Do Me Like That” and the number 15 “Refugee,” and spending seven weeks at number two on the U.S. charts; it would eventually sell over two million copies. Though he was at a peak of popularity, Petty ran into record company trouble again when he and the Heartbreakers prepared to release Hard Promises, the 1981 follow-up to Damn the Torpedoes. MCA wanted to release the record at the list price of $9.98, which was a high price at the time. Petty refused to comply to their wishes, threatening to withhold the album from the label and organizing a fan protest that forced the company to release the record at $8.98. Hard Promises became a Top Ten hit, going platinum and spawning the hit single “The Waiting.” Later that year, Petty produced Del Shannon’s comeback album Drop Down and Get Me and wrote “Stop Draggin’ My Heart Around” as a duet for himself and Stevie Nicks. Featured on her album Bella Donna, which was recorded with the Heartbreakers’ support, “Stop Draggin’ My Heart Around” became a number three hit. Petty & the Heartbreakers returned late in 1982 with Long After Dark, which became their third Top Ten album in a row. Following its release, bassist Ron Blair left the band and was replaced by Howie Epstein, who previously played with John Hiatt. 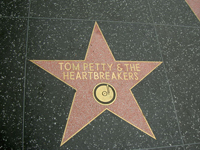 Petty & the Heartbreakers spent nearly three years making Southern Accents, the follow-up to Long After Dark. Hiring Eurythmics‘ Dave Stewart as a producer, the band attempted to branch out musically, reaching into new territories like soul, psychedelia, and new wave. However, the recording wasn’t easy — at its worst, Petty punched a studio wall and broke his left hand, reportedly in frustration over the mixing. Southern Accents was finally released in the spring of 1985, preceded by the neo-psychedelic single “Don’t Come Around Here No More,” which featured a popular, pseudo-Alice in Wonderland video. Southern Accents was another hit record, peaking at number seven and going platinum. Following its release, Petty & the Heartbreakers spent 1986 on tour as Bob Dylan‘s backing band. Dylan contributed to the lead single “Jammin’ Me,” from the Heartbreakers’ next album, Let Me Up (I’ve Had Enough), which was released to mixed reviews in the spring of 1987. Just after the record’s release, Petty’s house and most of his belongings were destroyed by fire; he, his wife, and two daughters survived unscathed. 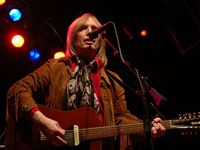 During 1988, Petty became a member of the supergroup The Traveling Wilburys, which also featured Dylan, George Harrison, Roy Orbison, and Jeff Lynne. The Wilburys released their first album at the end of 1988 and its sound became the blueprint for Petty’s first solo effort, 1989′s Full Moon Fever. Produced by Lynne and featuring the support of most of the Heartbreakers, Full Moon Fever became Petty’s commercial pinnacle, reaching number three on the U.S. charts, going triple platinum, and generating the hit singles “I Won’t Back Down,” “Runnin’ Down a Dream,” and “Free Fallin’,” which reached number seven. In 1990, he contributed to the Traveling Wilburys’ second album, Vol. 3. Petty officially reunited with the Heartbreakers on Into the Great Wide Open, which was also produced by Jeff Lynne. Released in the spring of 1991, Into the Great Wide Open sustained the momentum of Full Moon Fever, earning strong reviews and going platinum.